God is Jesus. God looks exactly like Jesus. In 30 A.D., the God that people for thousands of years were trying to know but never really knew, finally made Himself known to the world (Hebrews 1:3, John 1:14). We may ask why he took so long to make himself fully known, but he didn’t wait any longer than he had to. At the time of Jesus, Roman roads had only recently made it possible for the Gospel to travel far and wide. The Pax Romana (Roman peace) made it possible to travel those roads with reasonable safety. And a common language, Greek, started to be spoken among different people groups, allowing them to communicate with each other as never before. God made himself fully known at the first point in human history where this revelation could be spread. We are able to know God’s exact character and read Scripture with that knowledge, but it hasn’t always been that way. This was a hard revelation to swallow for Christ’s disciples. Some still have trouble with it today. Some would place the teachings and life of Jesus along-side the life and teachings of the Old Testament prophets as equals. God seems to take issue with that. 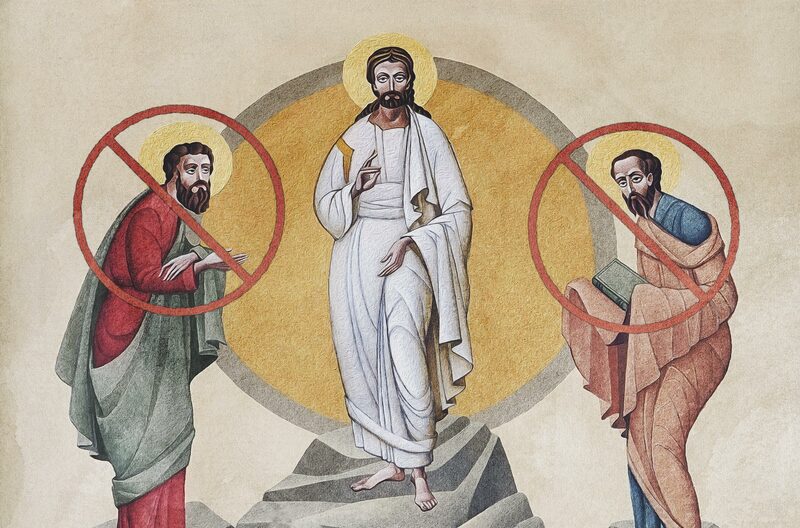 The Transfiguration of Christ is a strange story that appears in all three of the synoptic Gospel accounts (Matthew 17:1-8, Mark 9:2-8, Luke 9:28-36 and referenced in John 1:14) which would suggest it is important. What exactly is going on in this story, and what does it all mean? Jesus took Peter, James, and John up a high mountain alone where they could pray. While Jesus was praying, his face shined as bright as the sun and his clothes turned “as bright as a flash of lightning.” If this wasn’t strange enough, then appeared a vision of Moses and Elijah from the Old Testament.1 Moses and Elijah were talking to Jesus about him fulfilling Scripture. Peter said to Jesus, “Lord, it is good for us to be here. If you wish, I will put up three shelters—one for you, one for Moses and one for Elijah.” While Peter was mid-sentence a cloud covered Jesus, Moses, and Elijah and voice proclaimed: “This is my Son, whom I love. Listen to him!” When the disciples heard the voice they were afraid and fell to the ground. Jesus came and touched them. “Get up,” he said. “Don’t be afraid.” When the disciples looked up, they saw no one except Jesus. A week prior to the events on the mountain top, Simon Peter made his great confession about who Jesus is: “You are the Messiah, the Son of the living God.” (Matthew 16:16) Jesus responded to Simon’s confession by saying, “You are Peter, and on this rock I will build my church.” This is the first time that Jesus ever mentions the Church and in this story Peter and the apostles become symbolic representations of it. Up on top of this high mountain, Jesus is revealed by God to be God. What follows is a fascinating revelation that puts the Old Testament into proper perspective. Moses and Elijah appeared to the disciples next to Jesus. These two figures were major symbols of the Old Testament with Moses representing the Torah (sometimes called the Law) and Elijah representing the Prophets. This is powerful symbolism. At the beginning of his ministry Jesus said, “Do not think that I have come to abolish the law or the prophets; I have come not to abolish but to fulfill.” What Moses and Elijah—the Law and the Prophets—had begun, Jesus would fulfill. This is exactly what Jesus is said to be talking to them about (Luke 9:31). The Transfiguration is where Moses and Elijah find their great successor. The Transfiguration is where the Old Testament hands the project of redemption and restoration over to Jesus. The Kingdom of God is where Christ’s project finds it’s fulfillment. This new nation based on the way of Jesus was what the Law and the Prophets were aiming for all along. When Peter sees Moses and Elijah he says to Jesus, “Rabbi, it is good for us to be here. Let us put up three shelters—one for you, one for Moses and one for Elijah.” (Matthew 17:4, Mark 9:5-6, Luke 9:33). The Greek word for “shelter” is skene, the same term used to translate the Hebrew for the tabernacle and the tent of meeting that became the means for God’s continuing presence with Israel after Sinai (Exodus 25-40). Peter still doesn’t understand the significance of what he is seeing. He calls Jesus “Rabbi” and wants to build three tabernacles. He is treating Moses, Elijah, and Jesus as approximate equals. God is about to set the record straight. Peter’s implicit suggestion that the Old Testament be given roughly the same authority as Jesus is the same mindset as those who believe that every part of the Bible has the same authority. What can happen with a flat reading of the Bible is that Jesus’s teaching of enemy love and nonviolence in the Sermon on the Mount can be conveniently ignored, since we can find divine sanction for violence in the Old Testament. In other words, Jesus can be overruled by Moses and Elijah. Peter was rebuked, God removed Moses and Elijah, leaving only Jesus and said “Listen to Him!” While Moses (the Law) and Elijah (the Prophets) were authorized to speak for God in their day, disciples of Jesus are to take their marching orders directly from Jesus and from Jesus alone. While the Law and Prophets had a place in history, it was temporary and is outshone by Jesus’s much greater and permanent authority. Followers of Jesus are therefore not to consider either the Law or the Prophets (Old Testament) to be permanent independent authorities set alongside Jesus, but must be rather understood entirely in light of, and in dependence upon Jesus. Moses and Elijah disappeared, and God said, “Listen to Jesus!” There’s now no possibility of Jesus being upstaged or countermanded by the Old Testament. Jesus is alone, and Jesus is all in all. The Torah was given by Moses. Grace and truth came through Jesus Christ. No one has ever seen God. The only begotten God who is near the Father’s heart, he has made him known. The Bible is not the full revelation of God, Jesus is. This is what John means when he dares to say that no one has seen God. It’s Jesus who reveals God. The Hebrew Scriptures are inspired. They are the inspired telling of Israel coming to know the living God— but the story doesn’t stop until we get to Jesus. If the Law and Prophets have anything to say to followers of Jesus, it is only because they point toward, and agree with Jesus. If anything in the Old Testament fails to agree with Jesus, however, the implication is that it is Jesus who should be followed. Nothing in the Old Testament should be allowed to compromise what Jesus reveals about God’s character and will. The Law and the Prophets didn’t have the full picture of God’s character, but we do. The Bible is not a flat text where every passage carries the same weight. This is why Jesus can say things like, “You have heard that it was said, ‘An eye for an eye and a tooth for a tooth.’ But I say to you, do not resist an evildoer. But if anyone strikes you on the right cheek, turn the other also.” Jesus overwrites the Old Testament because the Old Testament is an incomplete picture of God’s will and character. The Law and the Prophets didn’t know that God looks exactly like Jesus, but we do.